What is the Size and Weight of the Cruise Stage? 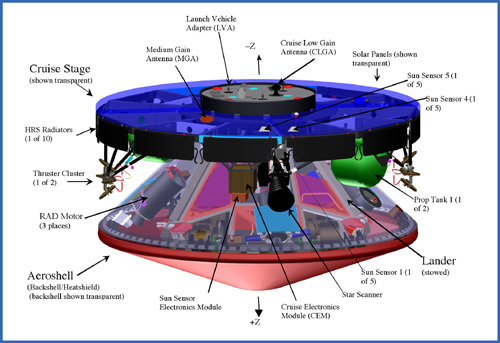 The cruise stage is the configuration of the spacecraft for travel between Earth & Mars. The cruise stage is very similar to the Mars Pathfinder design and is approximately 2.65 meters (8.7 feet) in diameter and 1.6 meters (5.2 feet) tall when attached to aeroshell. It has a launch mass of 1063 kilograms (about 2,344 pounds). The primary structure is aluminum with an outer ring of ribs covered by the solar panels, which are about 2.65m (8.7 feet) in diameter. Divided into five sections, the solar arrays can provide up to 600 Watts of power near Earth and 300 Watts at Mars. 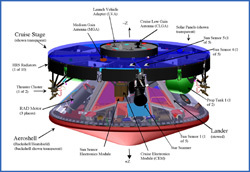 Heaters and multi-layer insulation keep the spacecraft electronics "warm." In contrast, there is also a freon system used to remove heat from the flight computer and telecommunications hardware inside the rover so they don't get overheated. Cruise avionics systems allow the flight computer in the rover to interface with other electronics such as the sun sensors, the star scanner, and the heaters. More details on what will happen during the Cruise Phase of the mission from the Mission Timeline. Star scanner and sun sensor The star scanner (with a backup system) and sun sensor allow the spacecraft to know where it is in space by analyzing the position of the sun and other stars in relation to itself. Sometimes the spacecraft can be slightly off course, a situation that is expected given the 320 million mile journey the spacecraft makes. Navigators thus plan up to six trajectory correction maneuvers, along with health checks. Cruise Low-gain Antenna The cruise low-gain antenna is mounted inside the inner ring and the cruise medium-gain antenna is mounted in the outer ring. During flight, the spacecraft is spin-stabilized with a spin rate of 2 rpm. Periodic spin axis pointing updates make sure the antenna stays pointed toward Earth and that the solar panels stay pointed toward the sun. The spacecraft uses the low-gain antenna early in cruise when the spacecraft is close to Earth. The low-gain antenna works like a light bulb, shining energy in every direction, so when the spacecraft is close to Earth, the majority of the energy transmitted to Earth reaches Earth. Cruise Medium-Gain Antenna As the spacecraft moves farther from Earth and closer to Mars, the sun comes into the same area of the sky as viewed from the spacecraft and not as much energy falls on the Earth alone. Therefore, the spacecraft switches to a medium-gain antenna, which acts more like a floodlight and can direct the same amount of energy into a tighter beam to reach Earth. Just like standing under a floodlight directs more light into one area than a normal light bulb does out of a lamp, the medium-gain antenna can direct the data from the spacecraft into a tighter beam than the low-gain antenna.